The son of a couple who was found shot to death inside their North Royalton home over the weekend has been charged in connection with their deaths, a detective confirmed Tuesday. Michael Lucak, 44, has been charged with two counts of aggravated murder, two counts of aggravated burglary, and one count of felony theft, police confirmed. 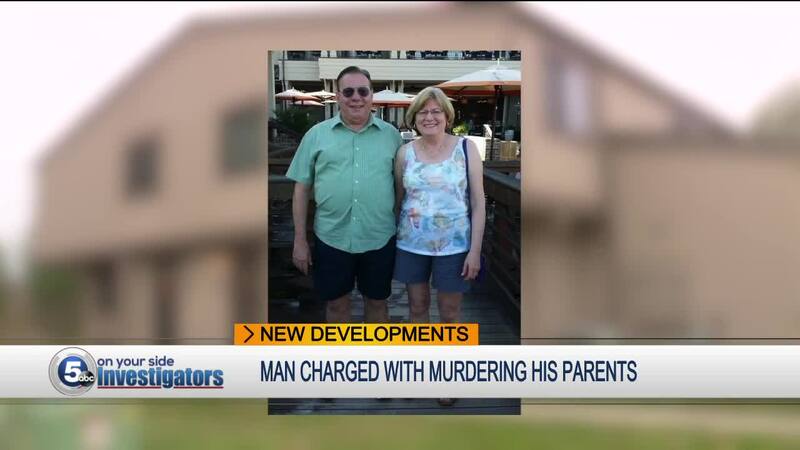 Helen and Dennis Lucak, both 72-years-old, were found dead at their residence in the 11800 block of Harbor Light Drive in North Royalton. Based on what investigators gathered at the scene, the couple was killed and locked in their bedroom after both appeared to have suffered multiple gunshot wounds, police said. Police said the couple was discovered on Sunday afternoon when Dennis' sister got concerned that they didn't show up for brunch at church. The sister went to the police after knocks at their door went unanswered. Initially, police said the sister believed the couple may have gone to Arizona to visit Michael. According to the police report, she told officers, Michael was in a drug rehab facility and "had gotten into some trouble recently." Investigators have not determined a motive for the murders. But Tuesday afternoon, detectives confirmed to 5 On Your Side Investigators that some of the items missing from the family's home were discovered when police searched Michael's truck and the Medina County motel room where he was staying. Police say they also recovered a 9mm handgun. Investigators said 9mm shell casings were found at the murder scene. Dennis and Helen were longtime parishioners at Archangel Michael Orthodox Church in Broadview Heights, where Dennis was also a deacon, a church staff member confirmed. Helen was a teacher at Raymond Elementary School in the Maple Heights School District who retired in 2010. Dr. Charlie Keenan, superintendent of Maple Heights City Schools, said in a statement, "She was a great teacher, loved by the students and staff. It is a tragedy to have someone pass away under these circumstances." A neighbor who spoke to News 5 said Helen and Dennis were a great couple and the last people you would expect this to happen to. The neighbor tried calling the couple yesterday after she noticed their car was still parked in the driveway and they hadn't gone to church. Investigators and the medical examiner said it appears they died on Saturday night.